More space – The average hotel room is only 325 square feet! Cramming the family into a cracker box is nobody&apos;s idea of a relaxing vacation. 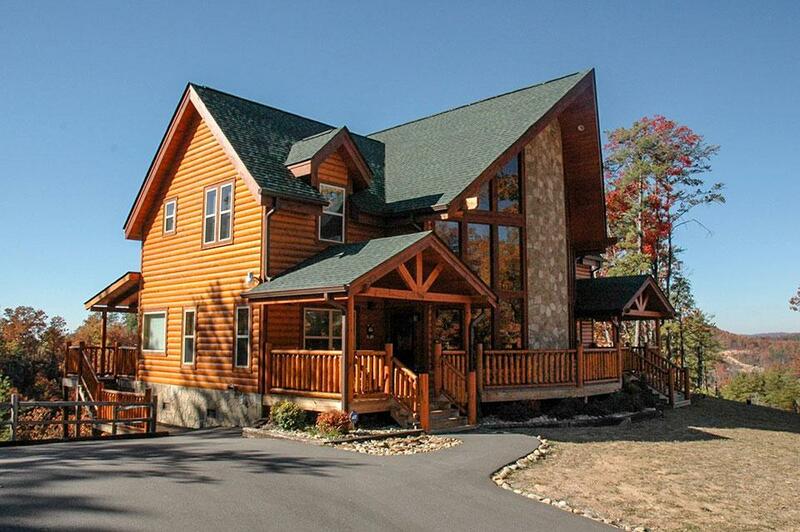 Even a one-bedroom Smoky Mountain cabin is double or triple the size of a hotel room. From cute 2-bedroom, 2-bath, 1,000-square-foot cabins like Paw Prints to 5,500-square-foot, 5-bedroom cabins that sleep 16, renting a cabin gives everybody their own space to relax in their own way. Cheaper per night – especially for 4+ people – Believe it or not, all that space actually costs less than a hotel room. Take Chili Bear, a 2-bedroom cabin with beautiful mountain views that can be yours for $100 to $170, or The Blessing, a four-bedroom cabin with mountain views and wraparound porches that runs between $230 and $320 per night. Split a cabin with another couple or family, take turns making meals, and you&apos;ll have a tranquil getaway for half the price. Reduced vacation expenses – Whether you make quick breakfasts and go out for big dinners, or grill on the patio of your cabin and watch the sunset, having a kitchen lets you keep a stash of snacks and easy meals so you don&apos;t have to eat at restaurants all the time. Cabins also come with free, fun activities that help keep everyone entertained without additional costs. If you&apos;re traveling with the family pet, you can rent a dog-friendly cabin for much less than the cost of kenneling for a week. More privacy – In a hotel room, your peace and quiet depend entirely on the people on either side of you. Rent your own cabin and you&apos;ll never have to worry about night owls, early birds or noisy people. Your cabin also gives everyone space to spend some time alone - an important but often overlooked necessity on vacations! If you don&apos;t share a bathroom with your entire family (or your traveling partner) at home, sharing a hotel bathroom is not a fun part of the vacation experience. Most cabins come with a bathroom for every bedroom. More amenities – Smoky Mountain cabins come with plenty of amenities like porch swings, rocking chairs, washers and dryers, grills, Jacuzzi tubs and more. These comforts can make you feel like you&apos;re vacationing in your very own mountain home. Built-in fun – Smoky Mountain cabins come with built-in fun. Most have DVD players and movies, game rooms, fire pits, pool tables and more. You can easily spend a fun week without ever leaving your cabin. Ask any vacationer who&apos;s managed to book travel during a week of solid rain and they&apos;ll tell you what a lifesaver space and indoor activities can be. Great location – Smoky Mountain cabins are close to all the attractions of Gatlinburg, Pigeon Forge and Sevierville. You&apos;ll feel you have the mountains all to yourself, but you&apos;ll also enjoy entertainment, museums and restaurants just minutes from your cabin. Make your own schedule – In a hotel room, you end up scheduling your day around maid service and restaurant hours. Rent a cabin and sleep as late as you want without worrying about that dreaded knock at the door. Get up for the sunrise and make your own coffee without disturbing anyone else, or stay up late playing games without worrying about bothering the neighbors. Plus, in a hotel, most people look for reasons to get out of the room. This leads to overly busy vacations when what you really need is a less-busy vacation. If you&apos;re in need of a non-scheduled vacation, renting a cabin gives you the option to chuck a busy itinerary and spend your time doing nothing. All-inclusive rates – Hotels may charge you more for Wi-Fi, views, parking, the contents of the minibar and more. Rent your own cabin and you&apos;ll never have to wonder what the bill is going to be at the end of your stay. Know what you&apos;re getting – Rent a hotel room and you&apos;ll see a generic photo of their very best room. This can make for unpleasant surprises when you check in. You may end up with no view, an obstructed view, or a room by the elevator! Rent a cabin and you&apos;ll get to browse dozens of pictures of the cabin you choose. You&apos;ll know exactly what you&apos;re paying for. If you&apos;re planning a vacation in the Smokies, renting a cabin is a great way to maximize your fun and minimize your expenses.